This is a course for professionals of any performing art who aim to improve their creative resources taking advantage of the physical tools that corporeal mime can offer. 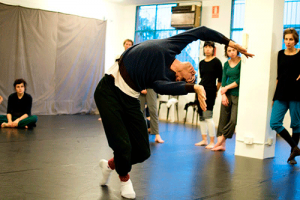 Taught by Mai Rojas, this course’s main objective is to share concepts and technical tools that allow the participants to develop their personal resources as the main element of theatrical expression. In particular the idea of sharpness and precision when using one’s body on stage, as well as presence and muscle tone. With this course Moveo aims at improving everyone’s abilities in front of devised work, through the exploration of the world of corporeal mime. The course offers looking at a variety of themes that take the form of “capsules”, independent from one another. Participants will develop a stage vocabulary related to the Corporeal Mime’s grammar, in relation to the articulation of the body and its movement in space, as well as the use of rhythm as a means of dramatic expression in a theatrical situation. We will work on group or individual pieces of Etienne Decroux and other authors in the field of Corporeal Mime. We will develop personal approaches to physical dramaturgy, in which participants explore the creation of individual and group pieces in a wide range of topics and technical premises. – 17th October to 19th December 2016. – 16th January to 27th March 2017 (no class on the 13th of February). – 24th April to 19th June 2017 (no class on the 1st of May). We’ll open new enrolment forms soon. Minimum 8, maximum 15 places. If you enrol in this course you will get the ACET’s card (Associació Catalana d’Escoles de Teatre), with which you will be able to enjoy discounts and special offers for theatre students.